That's one of the reasons I choose to run my painting holidays during these times. Not too hot and hopefully warm with big blue skies and sunshine. 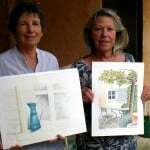 I use a chambre d'hôte in my village which is run by a very welcoming Swedish lady called Annika. It is a traditional French house furnished in the French style but with up to date facilities and with a beautiful garden. You can see some picture at Maison Quarante. This will be your residence and place for tuition and will come and join you over your four days to explore watercolour painting together. Choose from one of my dates or come when it suits you for one to one tuition or book a date and bring your own group. You have probably thought long and hard about booking a painting holiday, that's why I want to make sure your painting holiday experience meets your needs. You tell me what areas you want to work on and I will tailor make the tuition to suit. Groups are small and friendly and there is always plenty of individual tuition and plenty of painting demonstrations, showing you different ways to get the results you want. A minimum or four painting people are required for the group to run. Any less and I may use the right to cancel. 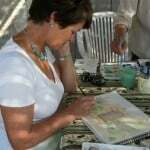 * How to look at your subject and gather as much information as possible creating preliminary sketches and notes. * Colours and colour mixing and value. .......... and no matter what level you are at you will find my simple exercises inspiring and informative. Watercolours have long been the medium chosen by the traveller and holiday maker, as a flexible and quick drying paint that is also easy to transport. 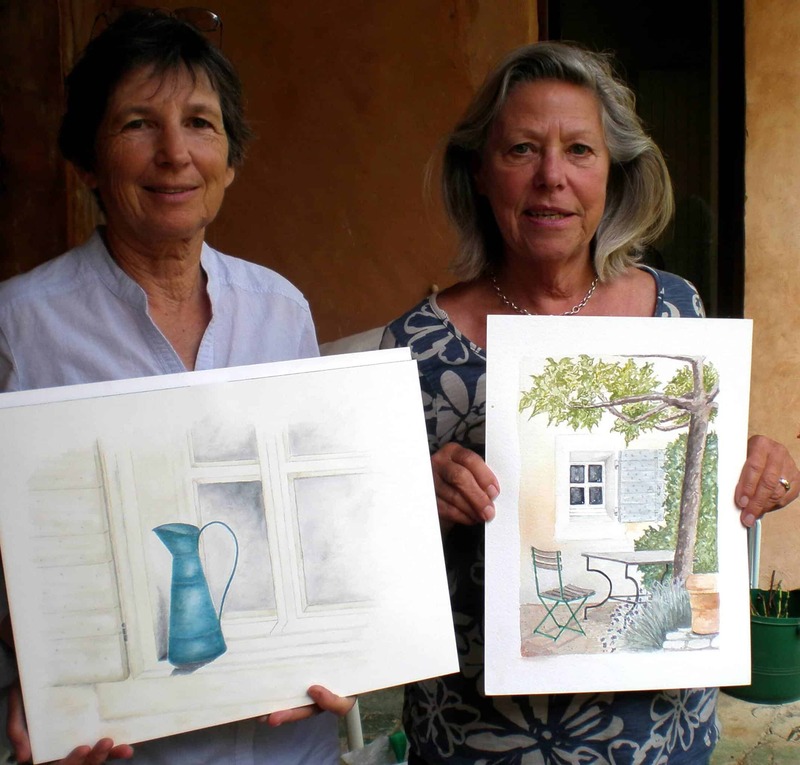 It is with wat ercolour paints that I will help you create your own souvenirs of your time spent in the stunning Languedoc region of the Herault. So what are you waiting for? The more information you give me about you experience and what you want to learn, the better I will be able to assess what your needs might be and start preparing for you before you even set foot in the country. When possible I like to meet my new arrivals before we get started, to chat, have a glass of wine and a bite to eat and discuss what your requirements may be. The schedule below is just an outline and will be modified to cover the subjects and techniques that you want. Weather permitting we can work in the large garden or venture into the village but we do not go out to the coast or to other villages as the travelling can seriously eat into your tuition time. So I prefer to stay close to home so that you can make the most of your time with me. 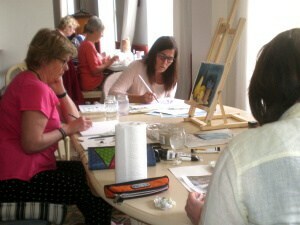 Apart from getting the most from your painting tuition I hope you will also get a great 'French' experience. Maybe it's your first trip to France or to this region, so both I and the people you will be staying with will help you anyway we can. Flexibility is the name of the game as far as I'm concerned, after all it's your holiday. It's also important to know that if you are bringing a non painting partner or family with you, there is plenty for them to do in the nearby area. Monday and Tuesday- Basic sketching skills will be looked at including the effective use of your pencils, composition, perspective, and how to create a useful sketch book for gathering information. 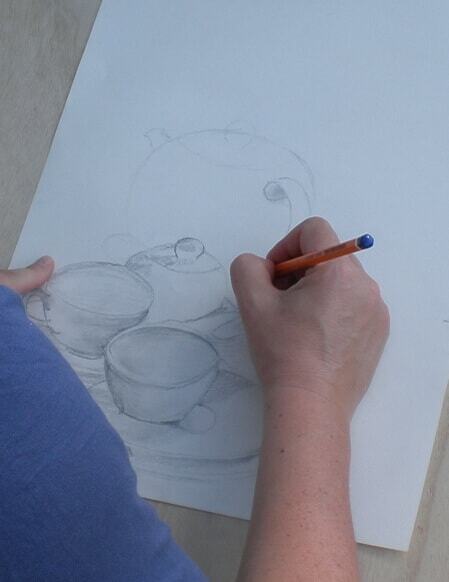 A simple still life will be included to get you warmed up and to assess your needs. We will take a look at water colour paints and the many ways in which they can be used. 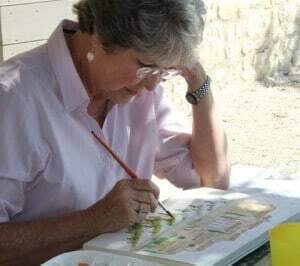 This will include a variety of painting techniques, colour mixing, colour values, paint washes and the effective use of your brushes After time to practice you will be able to select your subject to paint either from your own sketches, photographs or learning from one of my own paintings. Wednesday - At leisure enjoying this beautiful and historic area, which ever way you want to. Materials and Equipment: You will need to bring your own materials and equipment which you would normally use on a painting session. We will provide lightweight chairs for outdoor excursions, jam jars for water, kitchen roll and drawing boards. If it's your first time: You will need to bring a watercolour paint box along with two or three paintbrushes suitable for watercolour painting. Your supplier will advise you. Along with a mixing palette, a 2B pencil, sharpener and eraser. If you do have watercolour pencils, masking fluid and other materials you like to work with bring those too. I will provide you with all the sketching and watercolour paper (300 gm) along with the sundries such as water containers, paper towel and I have a selection of brushes and extra paints if needed. Whether you are holding a conference, a team building boot-camp or an incentive, a creative event can be motivational, inspiring and rewarding, not to mention FUN. Let me design such an event to meet the needs of your company and participants. From a quick start into watercolour painting, empowerment through painting and a mixed media brain storming, any thing is possible. The event can be for just a few hours or over a period of a few days. I can even help you find a suitable place to stay. It's intense, it takes concentration and there's no where to hide, but it really is worth it, and it's your special opportunity to get the attention and tuition you deserve. If you are just about to start working with watercolour paints or you have used them before but need a little guidance, a 'one-2- one' with me could be just what you are looking for. 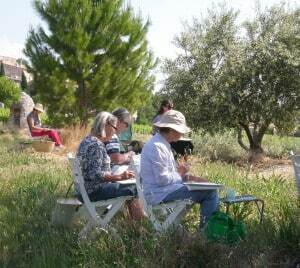 Come and visit me in the Languedoc region of the south of France and stay in one of the deligthful B&Bs in the village and spend your day, sketching, painting and concentrating on the things you want to learn. Not what the teacher or syllabus dictate. 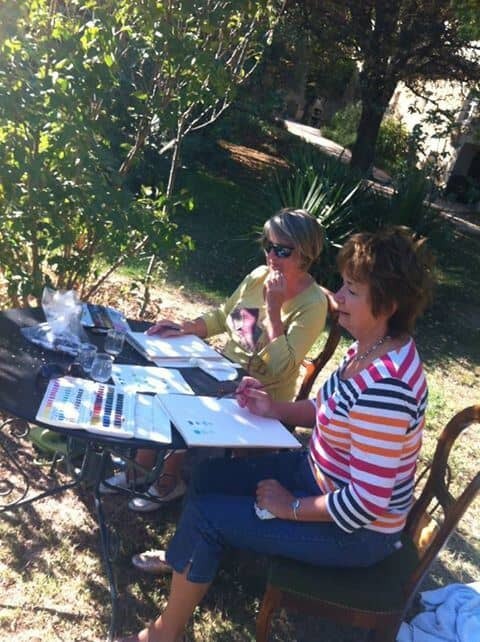 While you're here you can enjoy the food and wine and charming scenery of the area, and if you bring a non painting partner with you there's plenty to do to keep them entertained. Prior to your arrival we will communicate so that I can understand exactly what your needs are, giving me time to plan a programe which will bring you on quickly but comfortably. There's plenty of time for a laugh or two along the way and you will find that you will retain so much more by being in a relaxed learning environment. I will send you a list of what you will need to bring with you, but if you are a novice and don't want the outlay at the beginning, in-case you don't like it, I can supply you with all you will need for a small fee. Talking of fees I will charge you 30 euros an hour and you can have as much or as little tuition as you like when it suits you. Perhaps you are in the area for five days and would like two half days tuition, leaving time for exploring, this is easily arranged. You just have to tell me and I will plan it for you. What's more you can take up this opportunity anytime of the year, as long as I'm available. Complete flexibility. So what are you wanting for? Isn't your talent worth the investment. See you soon. 'I can't tell you how much I enjoyed my two days with you last week. You fulfilled all this for me and so very much more. You have a very easy teaching style which is great for beginners and I hope to grow with your advice and help. You are such a fabulous artist and I really want to be like you! I am so keen to come back for more. 'Having dabbled with watercolour classes in the past I knew I wanted to carry on painting but was badly in need of a confidence boost. Nicola's one to one tuition with an already planned to the south of France proved to be the ideal solution. Here are some of the lovely things that a selection of my clients, some now friends, have said about the tuition they received. Click on the YouTube logo to see some video interviews. What better recommendations could you have than the above. 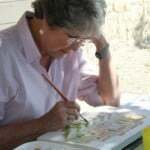 Painting and Other Creative Workshops. 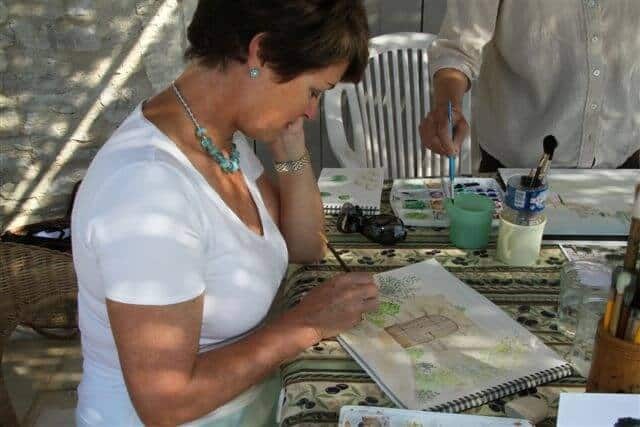 From time to time I also offer one day workshops and these can be a 'Quick start painting with watercolours, learn as you play' and get the basics to get you started. Here the complete beginner will feel right at home as I gently teach them enough to get them painting without overwhelming them. Also available is the 'Paint quick & fun greeting cards for Christmas & more occasions' here you will learn a variety of simple and quick designs that can be adapted for many occasions. There is another fun way to create greeting cards which requires no talent at all. This is the 'Take pretty papers, phrases, ribbons, feathers & more to make greeting cards.' Have fun as you rummage through my amazing collection of wrapping papers, motifs, feathers, flowers, quotations and embossed greetings as you create your original cards for.